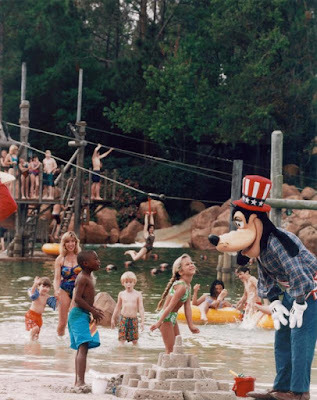 Goofy has a long history of playing in the water at Walt Disney World. One of his first watery endeavors were the water-skiing shows on the Seven Seas Lagoon, but that ended up only be a part-time gig until he found a permanent home in the waters of Bay Cove. When River County opened in June of 1976, Goofy was front and center to welcome guests. In the early years, Goofy could be seen taking a plunge down Whoop ‘N Holler Hollow, in his full-length, one-piece swimsuit that harkened back to fashionable swimwear of an earlier age. There were times when he was accompanied in the swimmin’ hole by Chip, Dale, and Disney’s other playful pup, Pluto. As the park entered into its second decade of operation, Walt Disney World had two other behemoth water parks that were entice guests away from the original water park, River County. Rumors began to swirl that the gator icon of Blizzard Beach, Ice Gator, had become such a hit that the other water parks should follow suit. While Typhoon Lagoon would get a gator of its very own, Goofy would hold the fort down over at River Country until the park closed for good. That isn’t to say that River Country didn’t find creative ways to get guests through the gates. In the 1990s the park launched the All-American Water Party headlined by, you guessed it, Goofy. His days of actually plunging into the water were over, but Goofy always knew how to make an entrance. Typically he would arrived via some sort of watercraft or on horseback. His All-American duds included jeans, a flannel shirt, and a stovepipe hat in an American flag motif. The party included giveaways, games, and a whole lot of feet stomping music from the live band, complete with banjo. Of course, a party isn’t a party without guests, and Chip, Dale, Pluto, and even Minnie were regular fixtures. One of the more rare characters in the Vacation Kingdom stables even made an appearance, I’m talking about Goofy’s son, Max, of course. These days Goofy’s trademark skills in and around the waterways of Walt Disney World have mostly fallen by the wayside as he has become more recognizable as the Great Goofini, a high-flying ace with a penchant for daredevil stunts that always seem to go awry. Whatever your feelings on River Country or Goofy, I’m almost willing to bet you can’t think back on Disney’s first water park without it conjuring up a memory or two of Goofy.